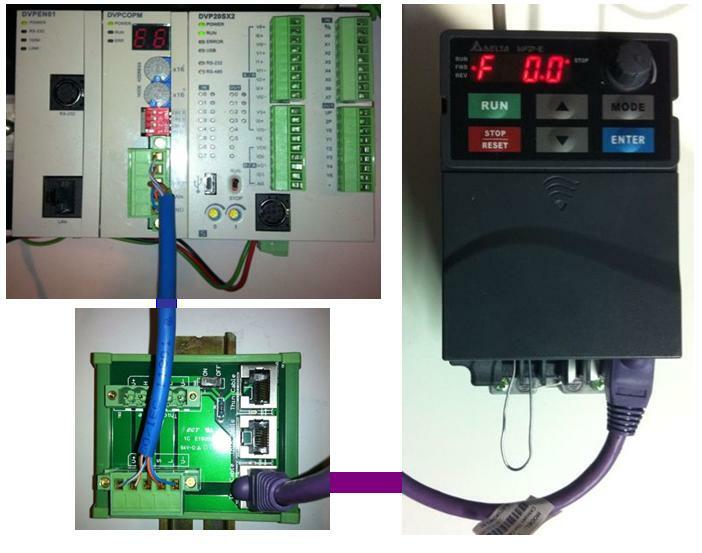 i have done almost all basic para metering and run procedures with CanOpen. and “Frequency Command” for VDF frequency. which index register will be used to change the motor direction in PDU Maping. i m doing a project with 25 VDFs with 3 delta PLCs and 2 HMIs. can i connect all devices with CANBuss? or should i connect only VDFs with Can-bus and rest of the devices with Ethernet? Can anybody tell me how to use control register of VFD E C.
I tested the dvpcopm with a SA2 plc and ifd9503 with a ss2 as slave , everything works fine.After this I added a altivar31 drive on the can network , the eds file for v1.2 is included in the canopenbuilder2.02 but i had to use eds for v1.7 . I can use the drivecom parameters(index 6040 , 6041) but any other parameter gives me bus errors (E1). I remember that problem, in this case you need to put the COB-ID number manually depending on the node number. But from CANopen Builder v2.02 available on the web, this problem is solved. Everything looks ok but one thing was not showed. I made such connections and in earlier versions of CanOpen Builder there was a problem with EDS file and mapping PDO parameters. I see that this project was made on CanOpen Builder 2.03 which … is not available yet.